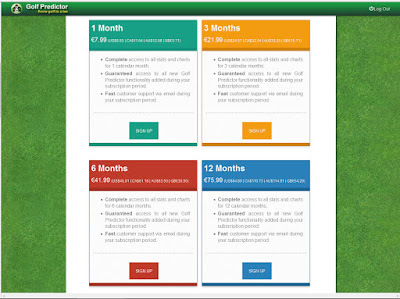 The subscription page on Golf Predictor have been updated. This change is purely cosmetic and adds significantly to the visual appeal of the page. Unfortunately, it will probably not ease the pain of paying, but at least it should make it more aesthetically pleasing! The before and after pictures are shown above, with the design of the new colour panels coming courtesy of Designify. As you can see, the new layout is a significant improvement over the original. After seven years, it was well due an update! 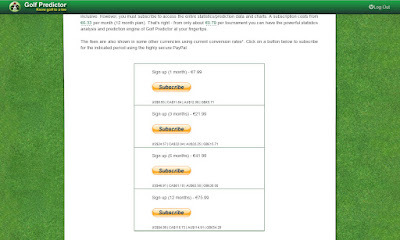 To make it more obvious that you will be paying with PayPal, I have added a PayPal banner above the panels on the new layout (not visible above). I have also finally updated the Golf Predictor banner on the PayPal payment page, as I only just realised it was still using an old image. If you experience any issues subscribing with this new page, please contact me immediately. Just another way to make Golf Predictor a little better!